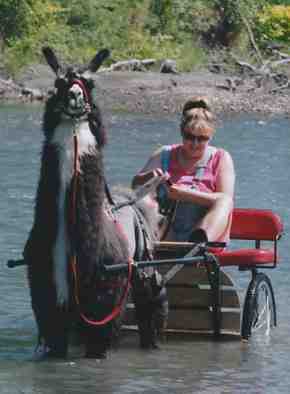 If I had known that llama driving would be so fun, I would have started 25 years ago! The sheer pride and pleasure of a cruise down the road on a sunny day is incomparable to anything else in my book! I have been driving llamas since 1996 now. Over the years, I have driven in shows, rivers, various parts of the country and more. During the Christmas season I have made trips to local towns to drive with friends. After decorating our carts and llamas with bells and even reindeer antlers, we went downtown. While there we visited with people on the streets and handed out candy canes. Many a person came out of stores or slowed in their cars to tell us how we had made their day! This was so much fun, we headed to another town here in Washington within the next week. Prior to coming, we made arrangements with the town to assure that we would be okay with city codes and ordinances. Again we decked the llamas and carts out and off we went to create more holiday cheer. 1. You need to make sure you are consistent in your training. 2. You can not expect to have a truly great llama without working with it. There is no replacement for time! 3. Just because an animal is big does not mean it will be the best cart llama. Some of the countries best cart llamas have been ones that are medium sized. 4. Attitude is everything! Yes, you can make a llama pull a cart, but if he does not want to do it....By using an animal that likes to get out and has a willing attitude it will mean the difference between chasing them and or having them waiting at the gate to go. If the llama is not willing to change his gate, it will take a long time to get down the road. 5. Not everyone is a trainer! In the horse world, most people pay someone to train their horses. If you don't have the ability to train, it's okay. There are many reputable trainers who will help you get the cart llama you have always dreamed of! Spend the extra money and make a purchase of an animal that will be a joy to drive. 6. Don't buy the equipment until you know for sure you are serious. We have assisted in the sale of many used harnesses and carts for people. Spend good money on the good stuff as the cheaper equipment only causes problems with the process. Not buying good equipment is like buying K-mart tennis shoes to run a marathon! 7. Select an animal that is conformationally sound and athletic. An animal that is not sound, will not be comfortable going out for long drives, assuming you want to do extended driving. 8. Talk to all the people you can that drive successfully and see what sort of information and advice they have. So few people drive (given how many llamas there are in the U.S.), talk to the people who really do and gather all the information you can. 9. Once you are driving, be careful who you give rides to or make sure you have good insurance. We all hope we never have an accident, but things do happen and you don't want to put yourself in a liability situation. 10. Driving is VERY addictive! So if you don't have a lot of time, beware!!! Niki Kuklenski is a five time national driving champion and trainer of her own driving animals. In addition she has given extensive input on cart and harness design. Niki has more miles and time in driving than anybody else in history!